John O’Brien was an Irish immigrant who was brought to live in New Haven Connecticut at the early age of four. He grew up there, and even throughout his time in the war, he showed a deep connection to the city which held many of his family. In his youth he was apprenticed to a print shop, and later on he became a student of Mr. Gunn at his school in Washington Connecticut. 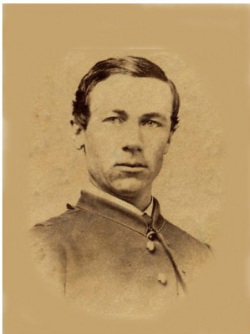 John O’Brien was one of the first Connecticut men to join the war, enlisting in the 4th Connecticut Volunteers in company F, the first three year regiment. He, along with the rest of his regiment, moved south and quickly became a part of the defenses of Washington D.C. as the 1st Connecticut Heavy Artillery. While at Washington, O’Brien took an interest in the sciences of war, and though his efforts to learn and understand, he gained promotion. Enlisting as a private, he quickly gained the rank of 2nd Lieutenant by 1863. As an officer he served in companies A, M, and I. Within the time of the war he participated in Gordon’s raid on Ft. Stedman and the battles at Petersburg Virginia. At the conclusion of the war he mustered out a Brevet Captain in the September of 1865. After the war, O’Brien traveled west, going to Montana and California, mainly working as a newspaper man, possibly returning to the trade he first apprenticed in. He eventually landed in Oregon to settle as a farmer sometime before 1880. He stated his own paper there, and also became a prominent person in the American Federation of Labor (AFL), serving as its president for a few years. He died in 1931 on his farm in Cottage Grove, Oregon.